George and I want to grow more goodness in our garden! 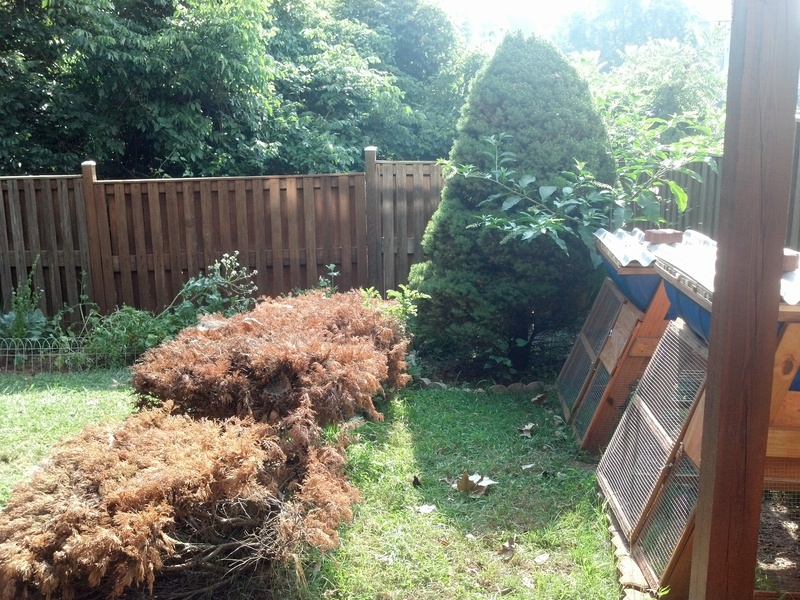 We discussed how to do this, and decided on creating some raised beds. The first will go right where this row of dead bushes is. We transplanted the bushes from a friend’s yard. 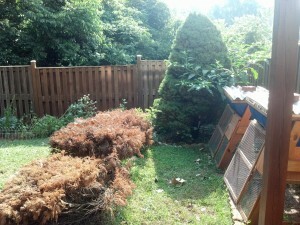 We hoped they would screen the beehives a bit and protect that area from the rest of the yard. Well, the bushes did not survive the transplant. I have since ripped them out, and now we have a rectangle of dirt where they were. It’s the perfect place for our first raised bed! 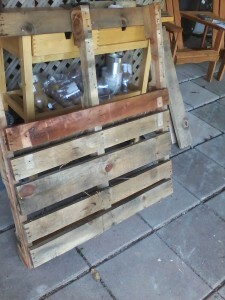 Since we knew this project would take a lot of wood, we decided to make it out of pallets. This would be cheaper, and environmentally friendly since we were reusing. 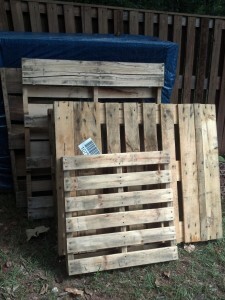 I will note that it was a pain to take apart the pallets. This project was a bit more manual labor than many of our projects. We were a bit troubled with how to legally get pallets, not keen on the idea of just grabbing them from behind a building. It turned out to be quite simple. While out and about we noticed a stack of pallets behind a store. 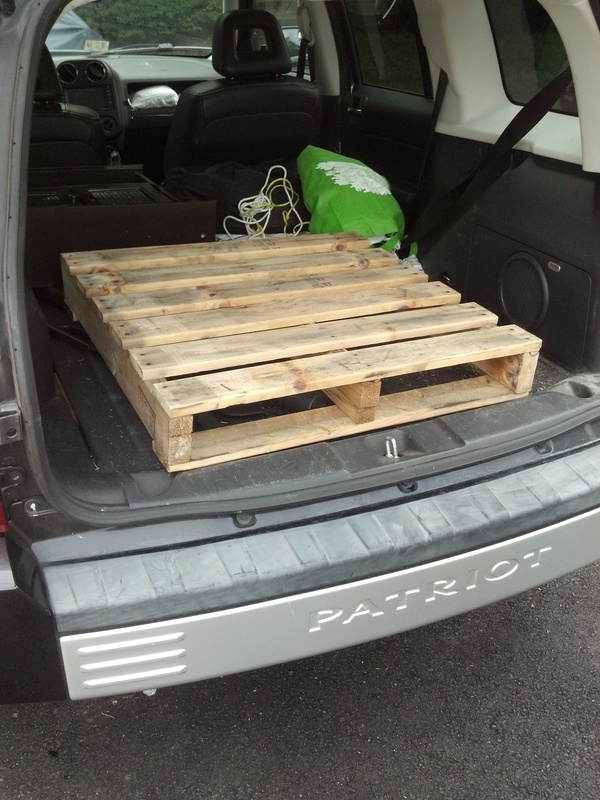 I noted the name of the store, and the the next day during business hours I called and asked if I could have the pallets. The company said yes, and the next day George and I drove up and loaded the car with pallets. I knew that the bed should measure about 4 feet wide by 10 feet long, or 48 inches by 120 inches. I had a stack of pallets of various sizes. How was I going to make this work? First I measured all the pallets, writing down the measurements. 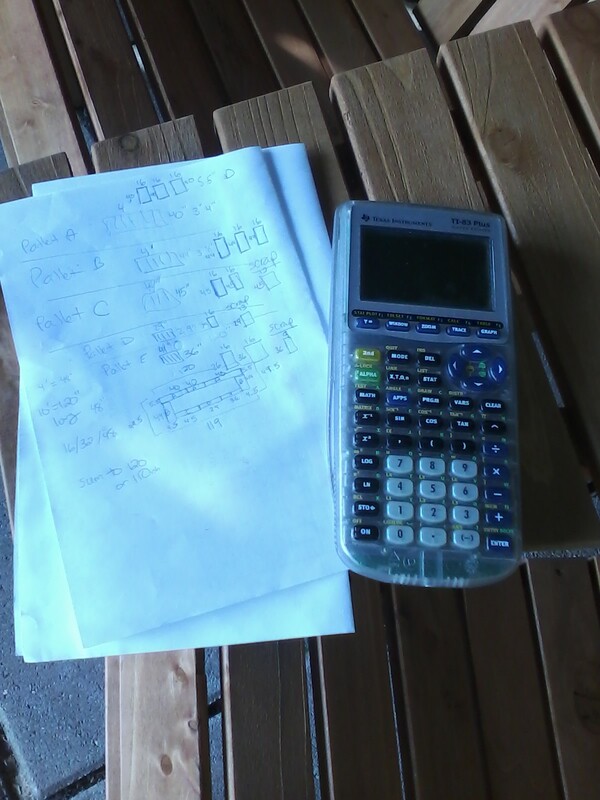 I made sure to note which measurements were running along the wood slats, and which measurements were for the side perpendicular to the wood slats. I knew that I wanted the wood slats to run horizontally along the bed. Then I had to figure out how high I wanted the bed to be. Looking at my measuring tape, I decided 16 inches would be the height. So then I took the pallet measurements, and drew out the 16 inch sections and leftover I would have from each pallet. 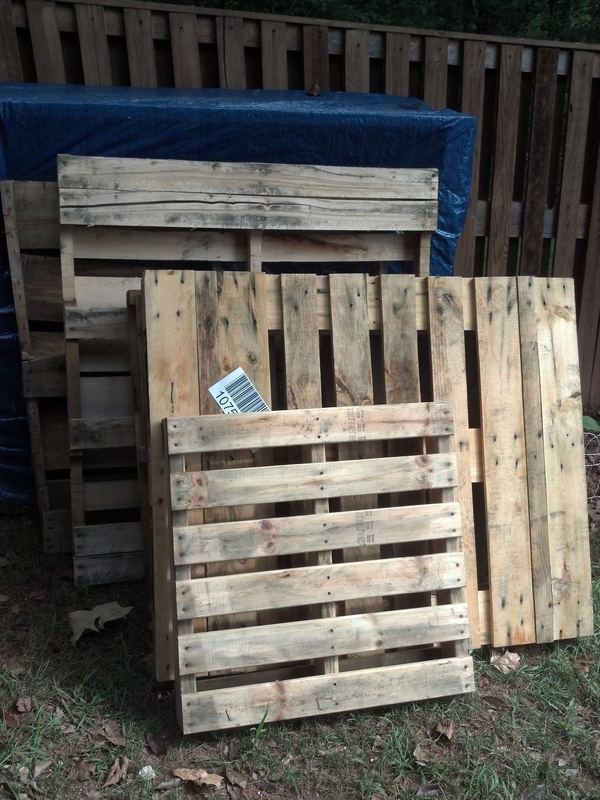 For example, Pallet A (randomly labeled) was 48 inches by 40 inches (parallel to slats). So if I wanted the sides 16 inches high, I would have 3 sections that would measure 16 x 40. Those three sections end-to-end would give me the 120″ I needed to make one long side. 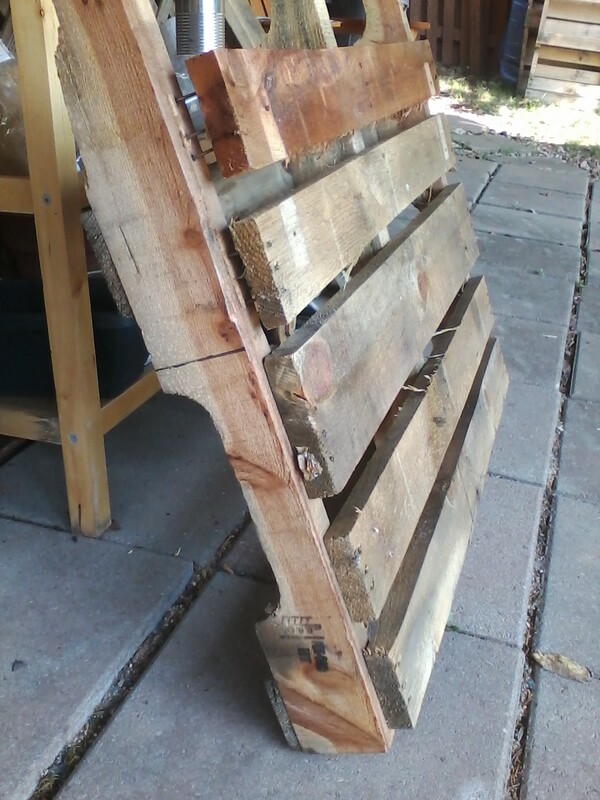 I pieced together the other 3 sides from pallets in a similar fashion. Now that I knew how I’d be cutting up the pallets, I used a measuring tape and marked the pallets where they should be cut. Pallet marked where it should be cut. 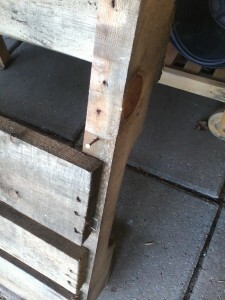 For some pallets, there were pieces we would not be using for the sides of the raised bed. 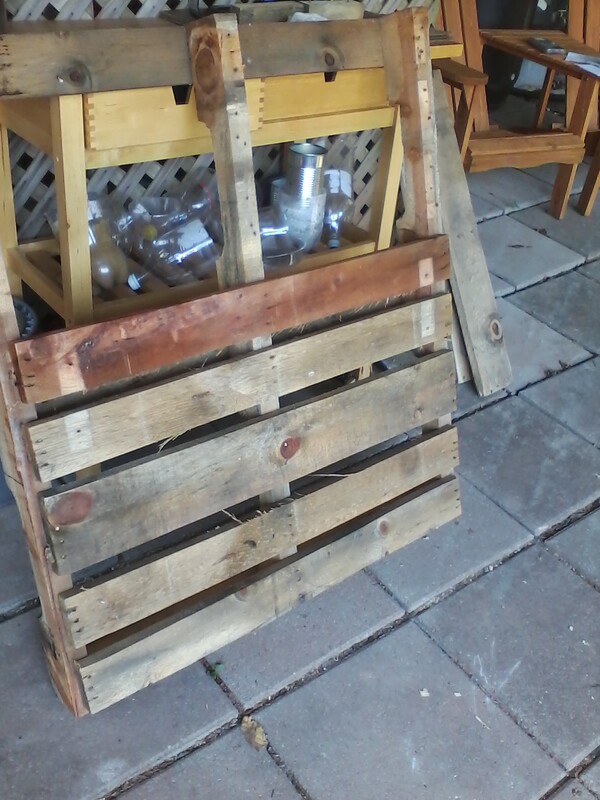 In the above picture we would be using the lower portion of the pallet for a side, but not the upper portion. Therefore, it was my job to pry off the slats on the unused portions so we could nail the slats over the holes on the portions we would be using. 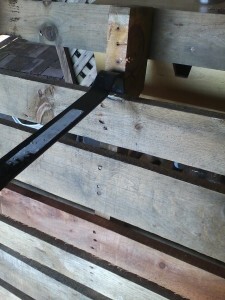 If you can imagine the lower part of the pallet as a garden bed, you can realize that unless we board up the spaces between the slats, dirt would spill out and the side wouldn’t be very good at holding the bed together. Prying off the boards was the most difficult step so far. I experimented and developed a pretty effective system for doing it, though. 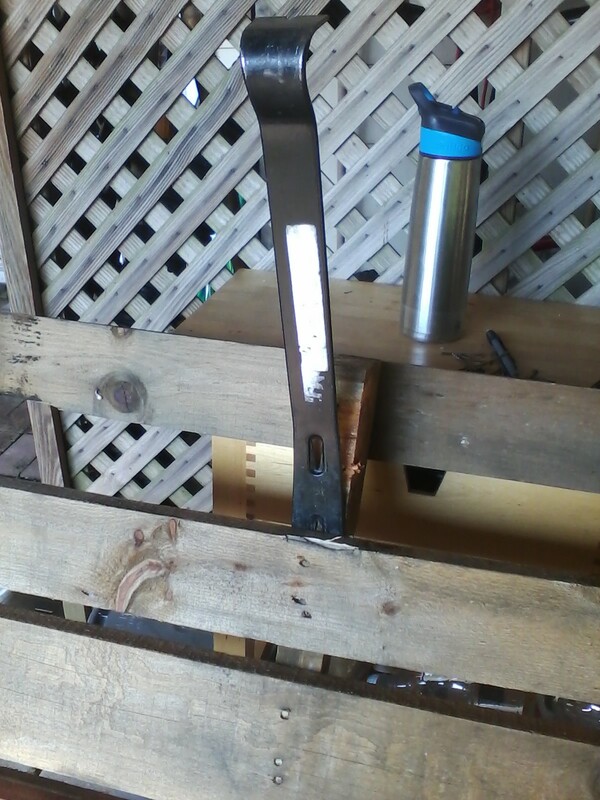 First step was to hammer the flatter end of the crowbar between the slat and the support. Be warned that this is a noisy process as you’re hitting metal on metal. Attempts to dull the noise with a cloth are pointless: I tried, and the hammering ripped the cloth. 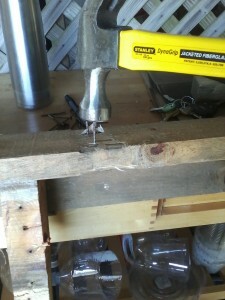 After the crowbar is hammered in well, like shown in the picture, pry with it going back and forth to loosen the wood slat. Then remove the crowbar, and put the bent end into the space you created. 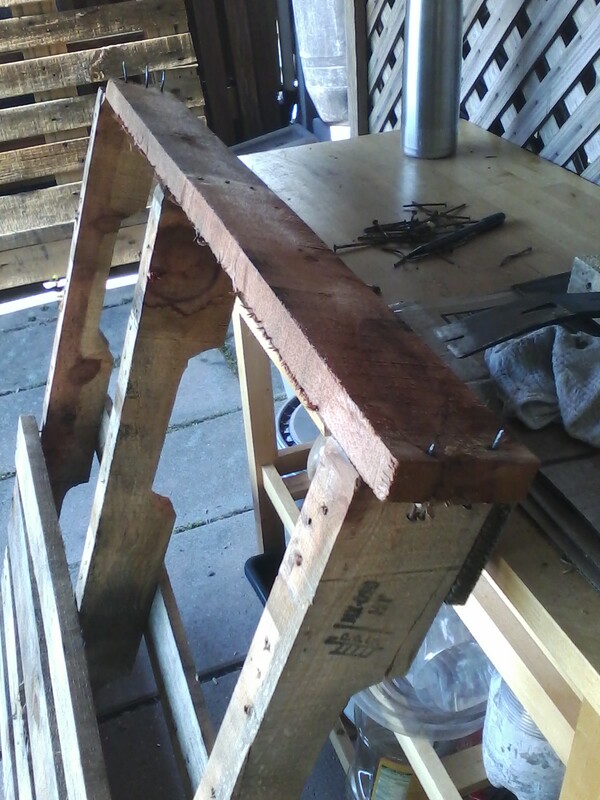 Once the bent end is well under the slat, pry with it, and you should have the leverage to completely pull the nails out of the underlying board. They will still be in the slat that you are removing. 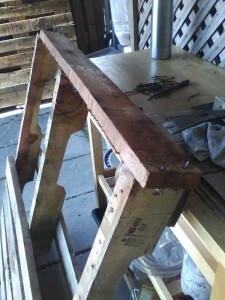 Repeat this process for all 3 places where the slat is nailed to underlying wood. DO NOT simply do this for 2 parts, and then attempt to use the slat to pry out the nails in the third area. 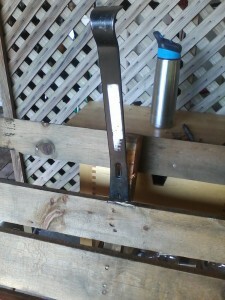 This bends the nails and makes the next step much more time-consuming. Once you have used the crowbar to release the slat from the underlying wood, you should have a slat with nails stuck in it. As shown in the picture, put the slat somewhere secure, and hammer the nails from behind to knock the nail heads loose of the wood. In the forefront of this picture you can see how the nail head has been hit down, so it’s free of the slat and the nail can be easily pulled out. Pull the nails out, and dispose of carefully. Now you have a slat that you can later use to plug up holes in your planter. You can remove any nails like this with your hammer. I did have a few nails that were so rusted, the head just collapsed and I couldn’t pull them out with the hammer. In those cases I hammered the nail sideways so that it was flat on/in the wood and not sticking out. Here you can see that I am working my way down the pallet, removing the extra slats above the portion of the pallet that will become a side of the raised bed. Removing these slats was hard work, especially with the heat wave we’re experiencing right now. But I figured it was better than being stuck inside on a summer day, slaving away for the money to buy new wood for a raised bed. Plus I was getting a free workout, and as soon as I was done I could play with my dog! 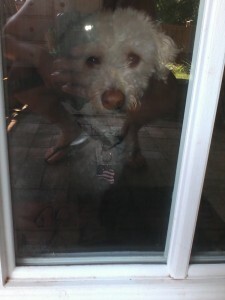 He was right inside the door, anxiously waiting for me to finish up. The dog was waiting just inside the door. In a future post I will describe our work of cutting the pallets, assembling the raised bed, and nailing in the extra slats to plug the holes in the sides.